I created a premiere file with all the scenes linked together. I am doing some rough scene and sound editing and I put together this very rough comp. Quote taken from Mark Kermode’s recent blog video on editing. 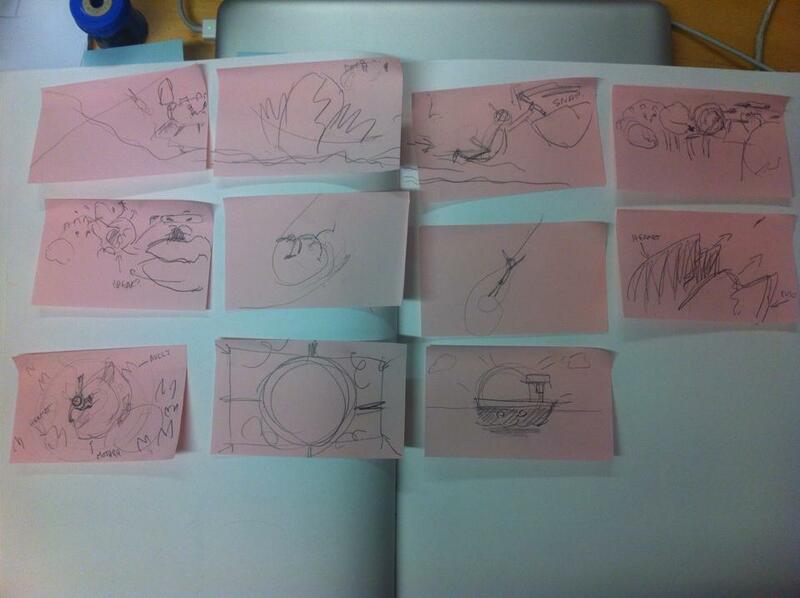 I have filled several pages of my note book with little thumbnail size shots that design the flow of the visuals. 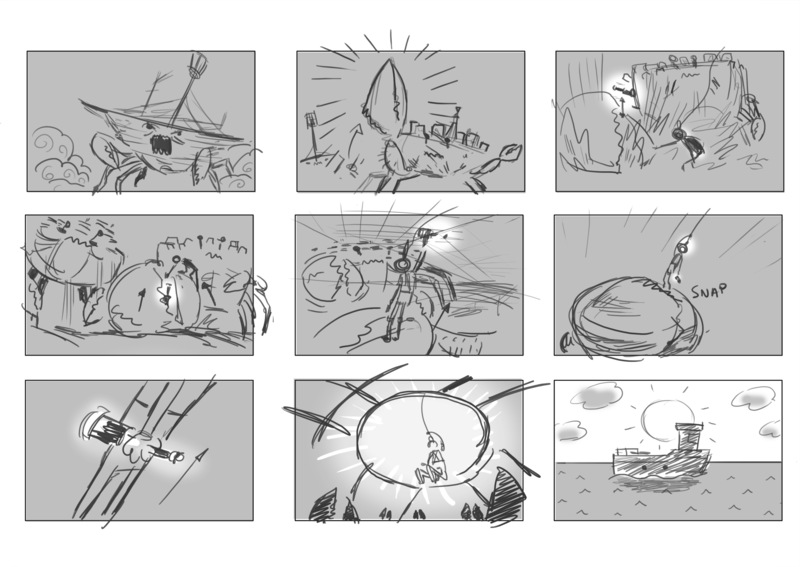 Doing quick thumbnails helped me resolve the story and edit it in a lot of ways. 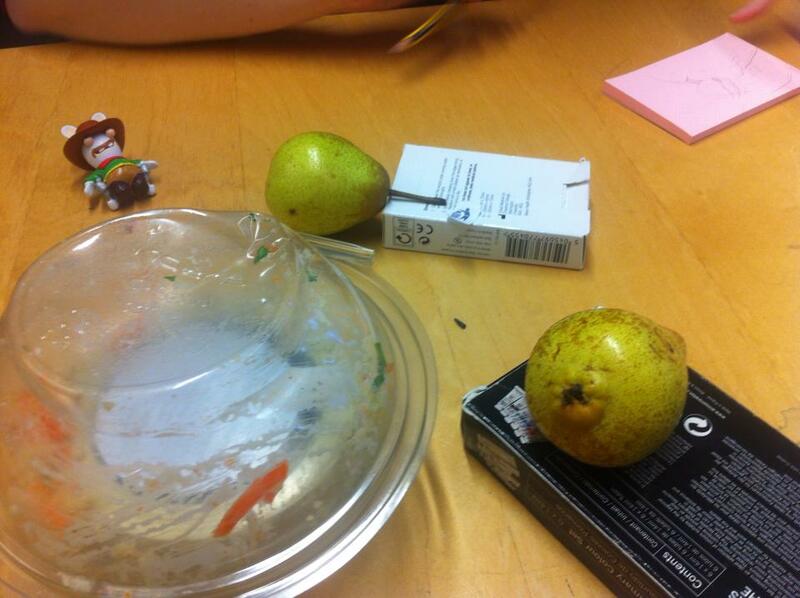 I took a lot out but added scenes to join up a not so clear links between images. 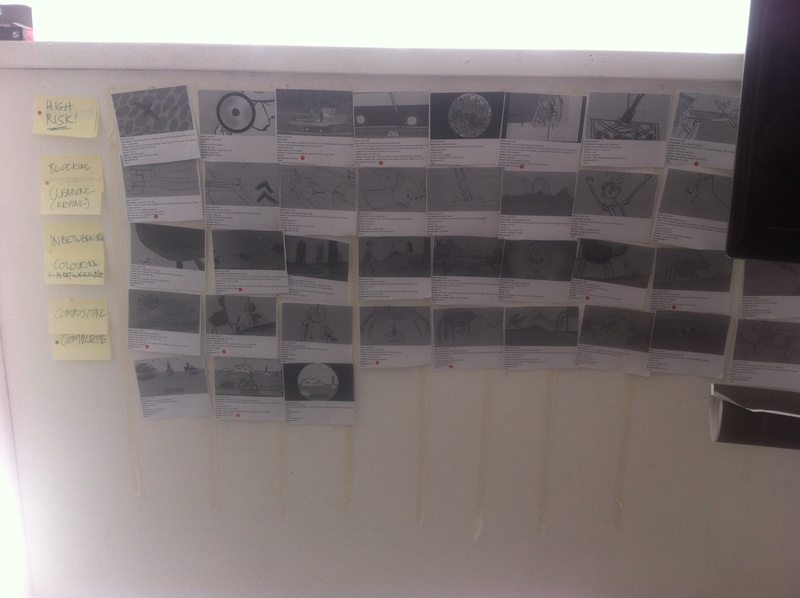 After I had it all worked out I did a storyboard and breakdown which I printed and stuck on a board in the studio. 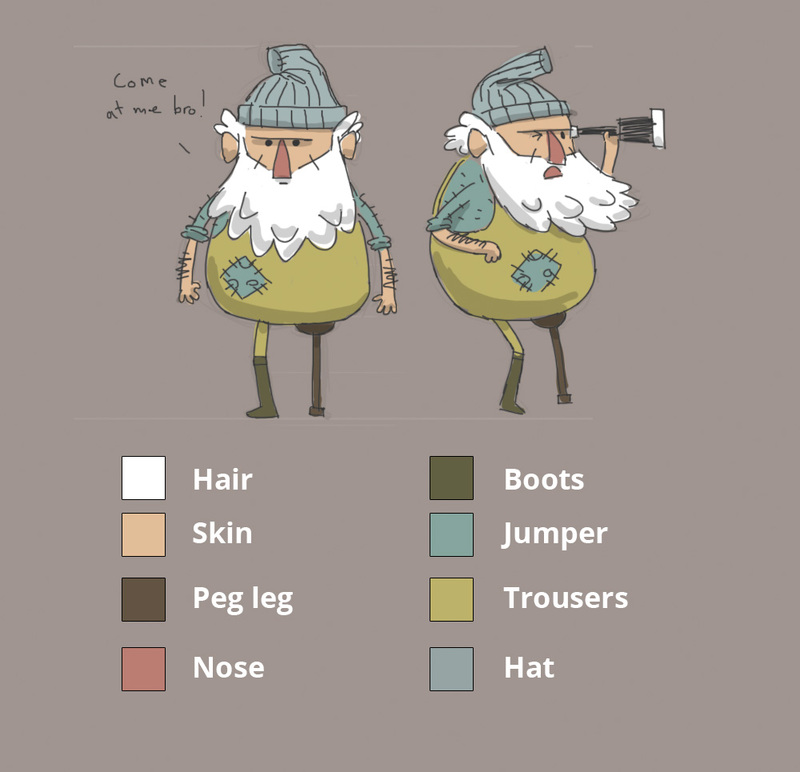 I have a colour system to track the stages of production as well as marking the scenes that are high risk because of the amount of work involved. 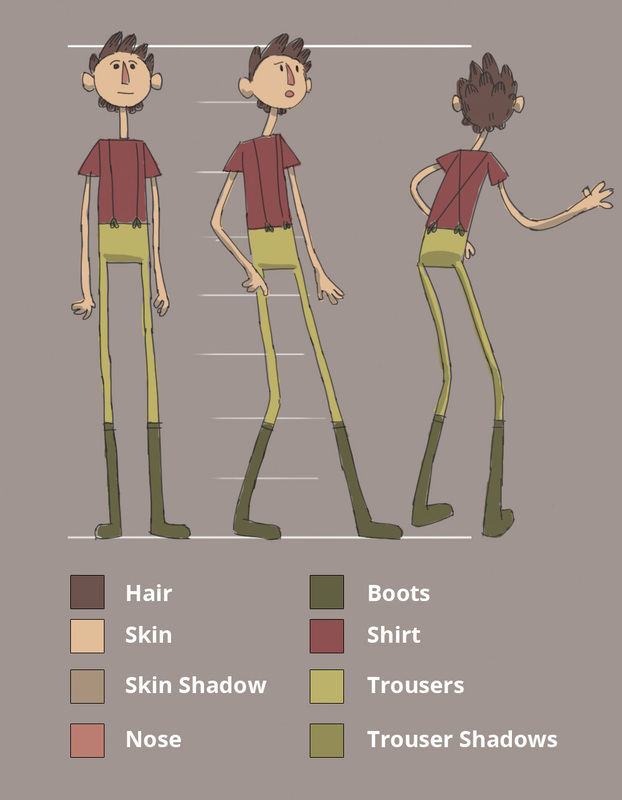 I also did new character sheets(digitally this time) for animators. 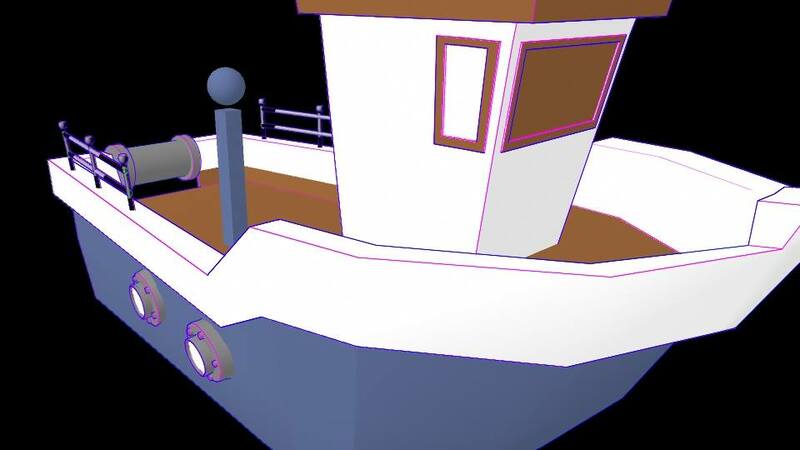 The boat model is going to play an important role in the background animations. I have a list of things that I want to achieve with it. I roughed these ideas out in my journal. 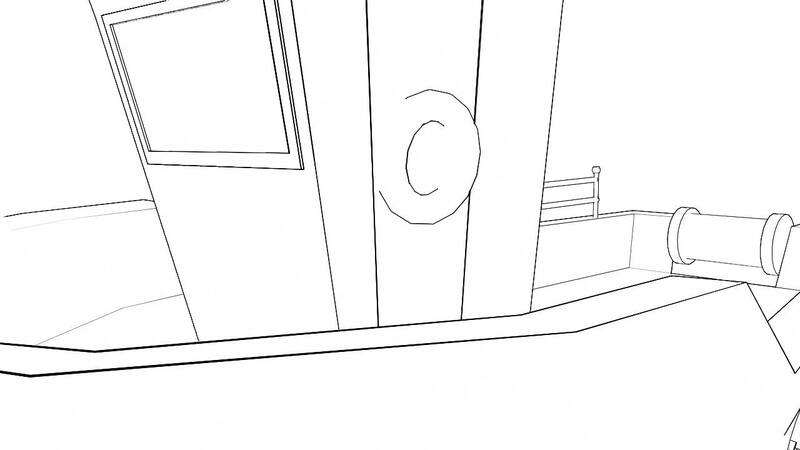 From doing this test I decided that I would blur the shadow and the toon line needed more work. 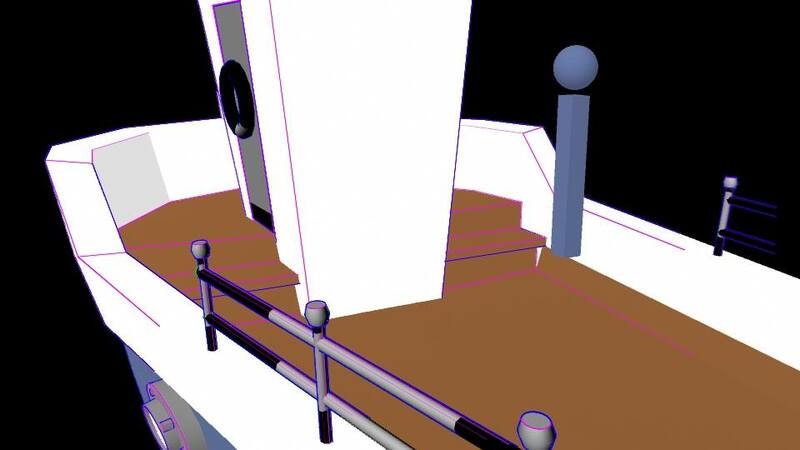 I also didn’t like the zoom, which I did in Maya. It creates a jarring effect when the sea doesn’t zoom. I think that I will do the zooming in After Effects. 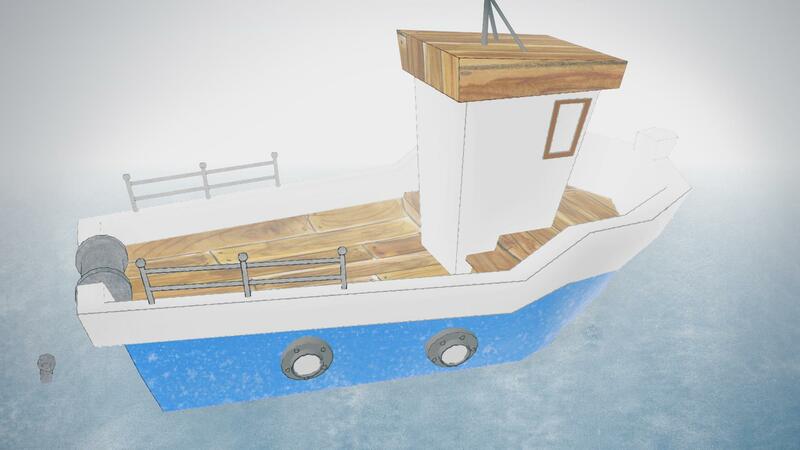 There is 2 ways to have the 2D animated characters on the moving 3D boat. 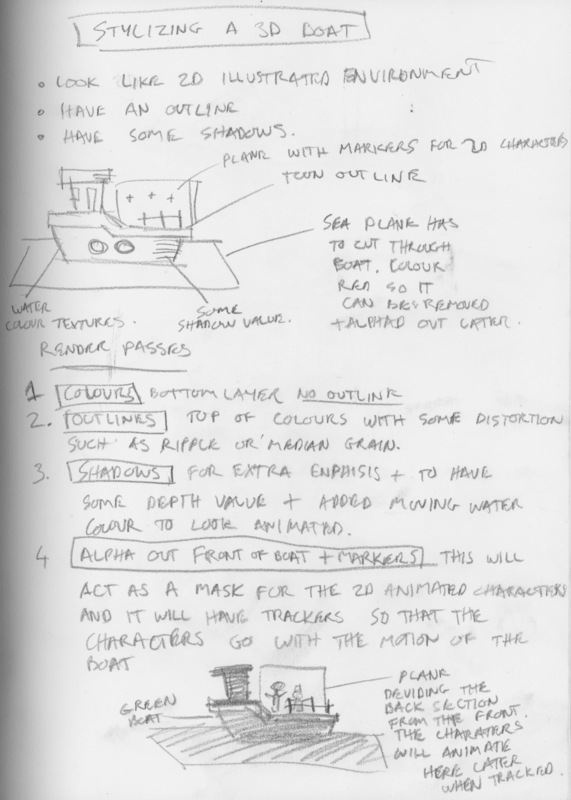 The first would be to have an ID render pass of the boat and the plane as separate colours, then in After Effects put the 2D characters on the coloured plane by using it as a mask and track the motion of the boat. 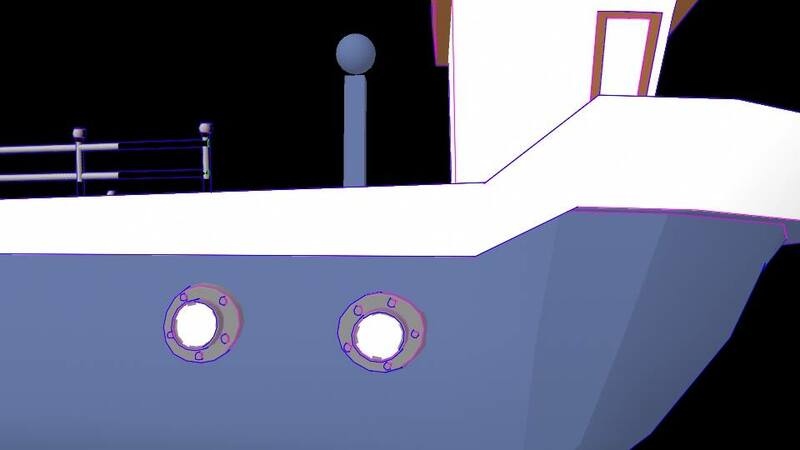 Reflecting on what I did, I realised I had done the boat movement a little too over the top. 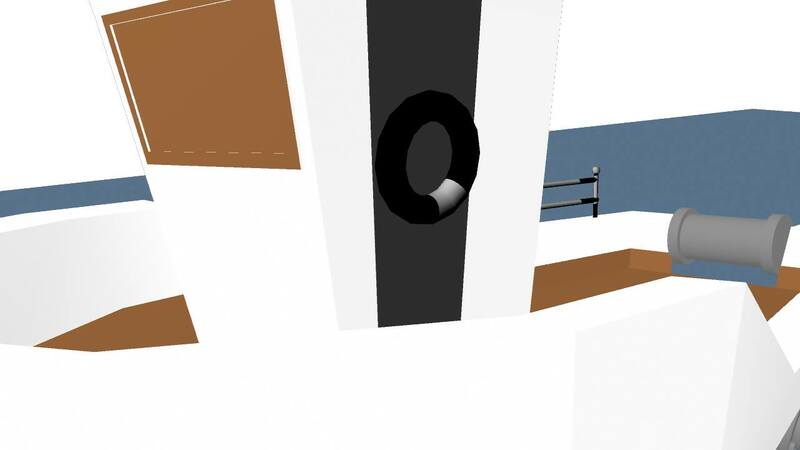 It should be smaller movements in the water, mostly up and down because the characters can sometimes look as if they are paper thin and I think this happens when they get rotated. All of these issues are being brought forth with testing. For my next test I will see how bringing them into After Effects looks using the ID pass idea mentioned in the first paragraph. 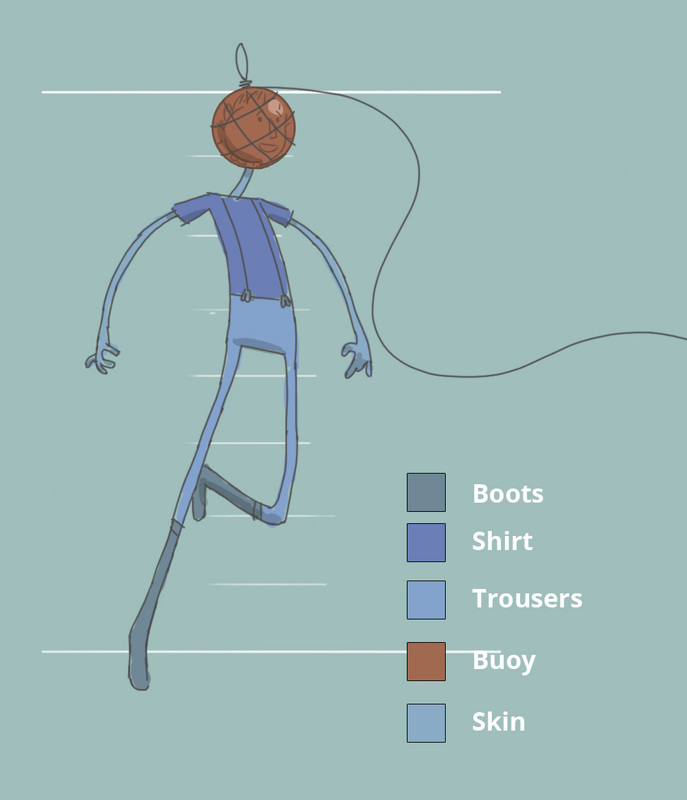 The best way to work on the toon outline in Maya is to add a colour to the various outline attributes (i.e. profile line, border Line and crease Line). Then it makes it easier to see how they intersect and what needs to be changed. I wanted to create an outline that looks as if its been created by an artists hand so I rendered out the colours and outline as separate images and brought them into photoshop as separate layers. I then added 2 filters to change the flow of the outline: Median and Ripple. I like the medium I had in Photoshop but found that in After Effects I wasn’t getting the same result with the same effect. I think this was because it was smaller resolution. The ripple effect works much differently in After Effects so I might not use this. I think for my next test I will apply a texture to the outline and merge it to the line to get a roughness and maybe even animate the texture by moving it. 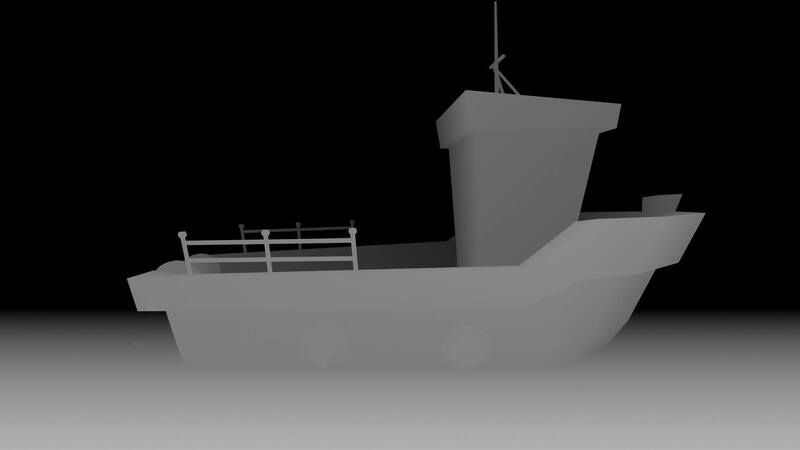 The scene is very foggy at the beginning of the animation and I wanted to reveal the boat in the fog in the establishing shot. I created a render depth pass and animated it. 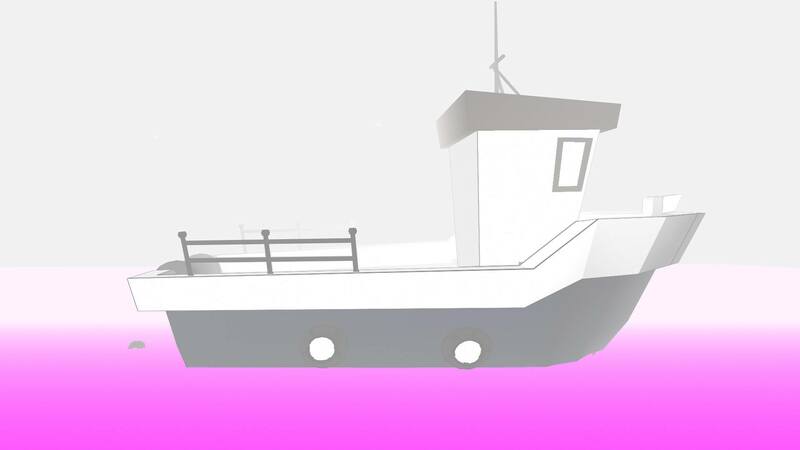 I then took it into After Effects and inverted the layer and set the mode to ‘screen’ and put it above a master render of the boat. This test was very successful and I will use it for my final animation. The only extra thing it needs is some fog shapes to move around in it. I could animate these shapes in flash and then apply a water colour texture in After Effects. the outline and the sea plane being masked. 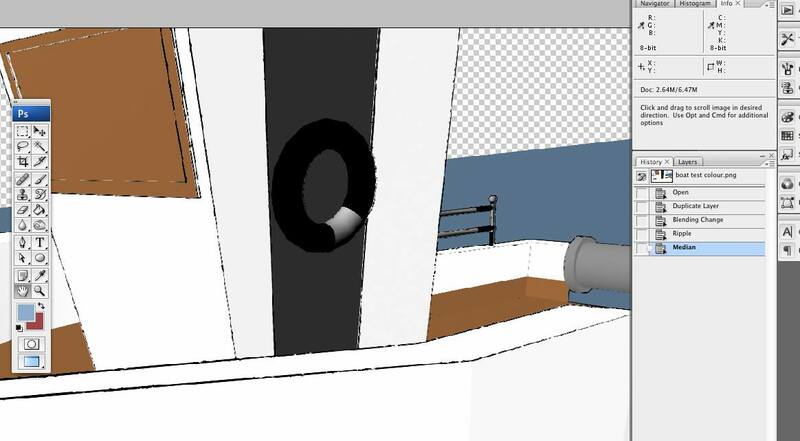 Things I’m unsure of still are the 2D characters on the plane on the boat, should they be brought into After Effects or rendered as a pass from Maya? I created the animatic in adobe premiere. 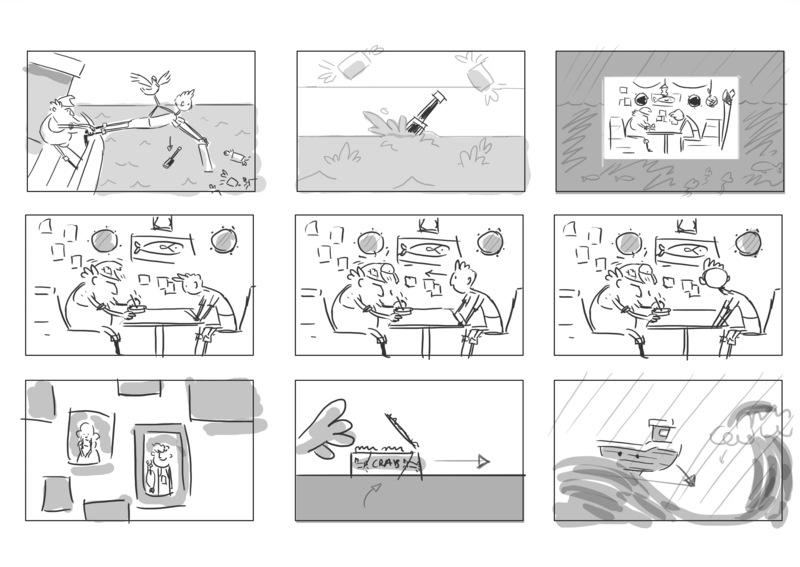 It is based on the storyboard that I created recently in photoshop, as well as the scene that me and Natasha had drawn out on post-it notes. 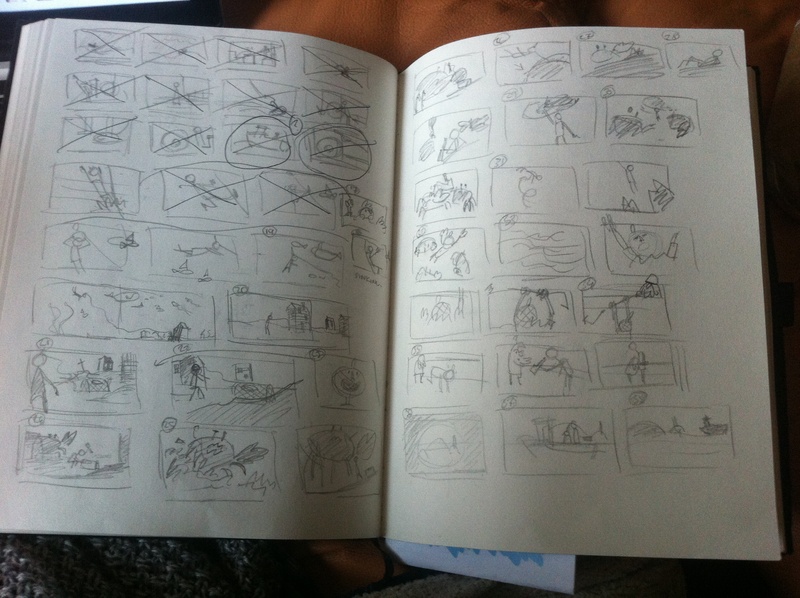 An animatic is essentially a moving storyboard. It can have sound as an added touch, although it is not as important really. However I find that it does add depth and I added some noises using Garageband. I prefer having sound over having a silent animatic. 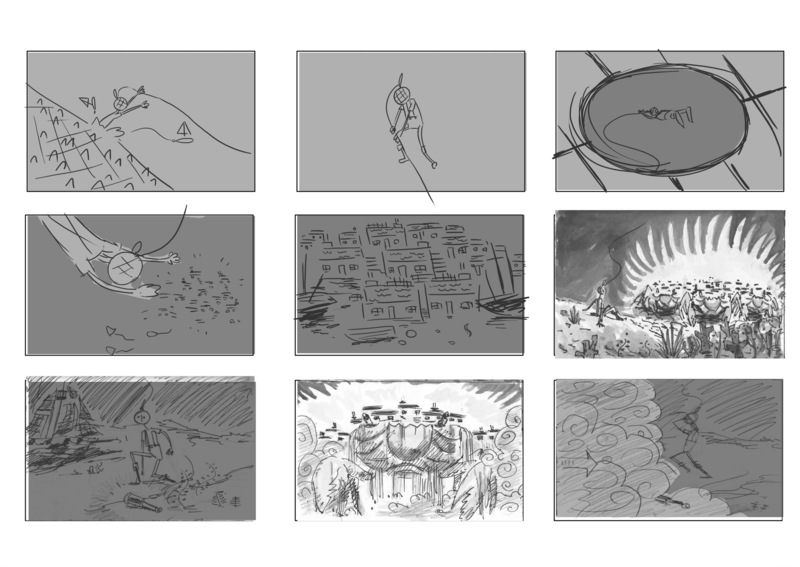 During the process of creating this animatic I got a better sense of the pacing the story and could tell were I needed to take some parts out or change some parts around. 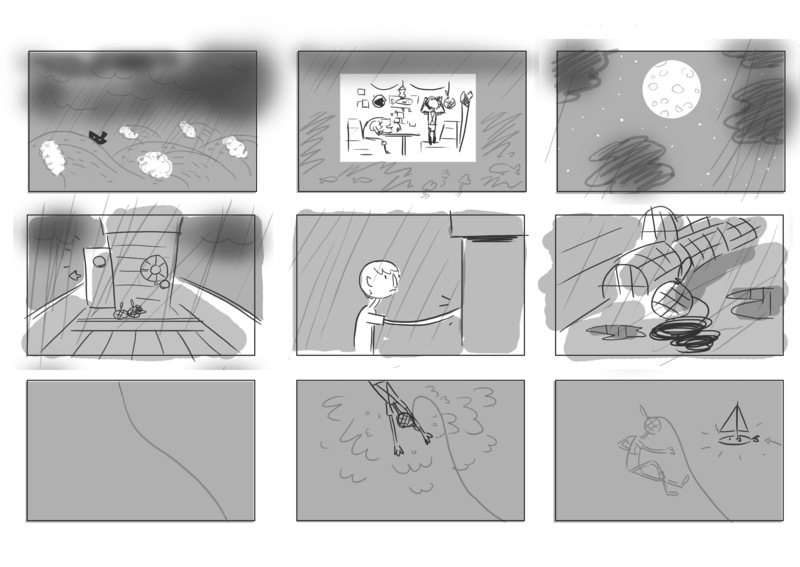 I didn’t exactly stick to using images from the storyboard, I redrew some of the shots and added some extra motions made by the characters in to give a better sense of what is happening in each of the scenes. I will show this to my team and ask for feedback. I will then use the timing and the shots to divide up the scenes into a detailed shot list, which we can mark during production to know what scenes are completed. I think this will be a very important resource. I didn’t score any of the animatic because I plan on getting our musician Fiona to come up with a score. I will have a discussion with her soon as well hopefully. I learnt many new techniques in Adobe Premiere, such as key framing to add movement and how to add a timecode on the footage. Premiere proved to be the quickest software to put together an animatic and make edits along the way. It may not be the best in resolution as all the images are rasterized compared to the previous animatic I did in flash, which looks a great deal smoother. Another problem I had with using premiere was that gave me an error each time I rendered out the footage and saved the file. I couldn’t figure out what I was doing wrong or if this was a bug. I know the only way of resolving it was to save out a new version of the file each time I was making a change, which was annoying but meant that I had a lot versions incase anything went wrong with the file. All of these added up make for a lot of complexity that needs to be worked out. So to break things down we decided to act out the scene with objects that could represent the characters and their scale. 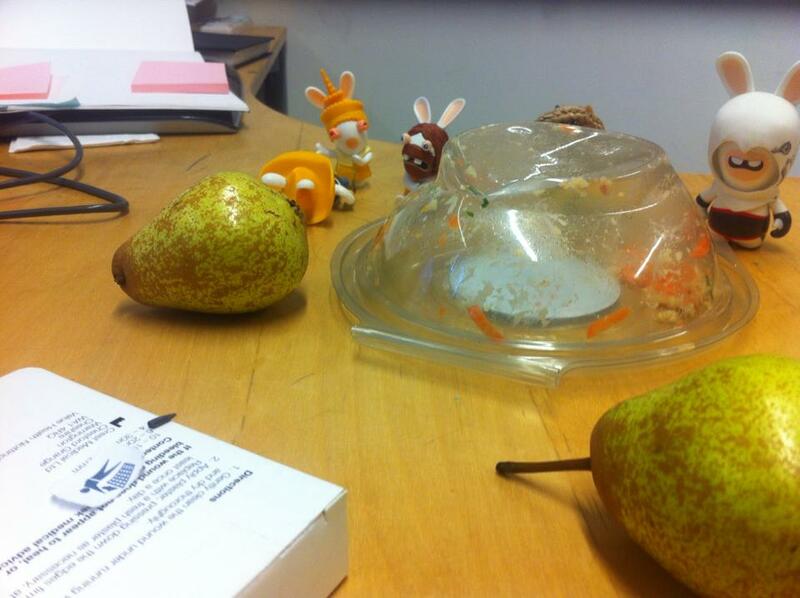 Before break I asked for Natasha to go home and bring back some of her toys so we could act out the scene. 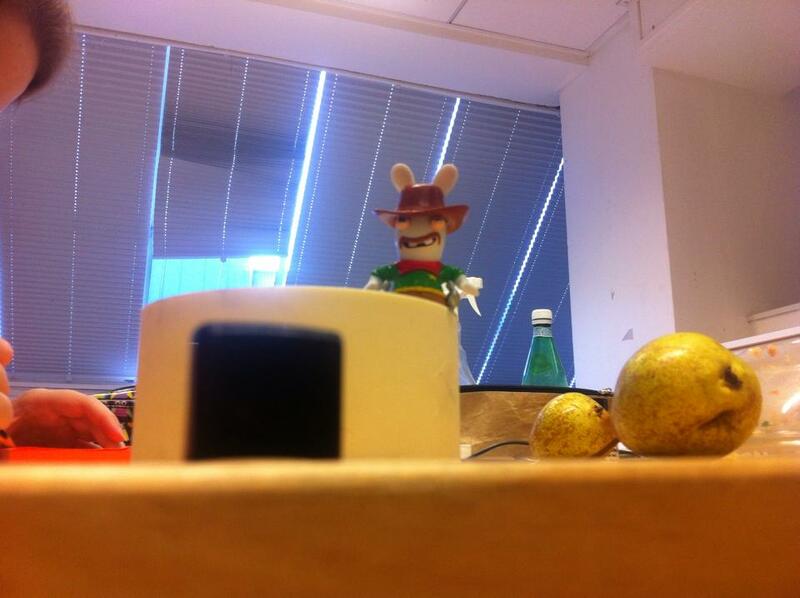 I took some of the important shots using my phone and we drew on post-its and stuck it together. 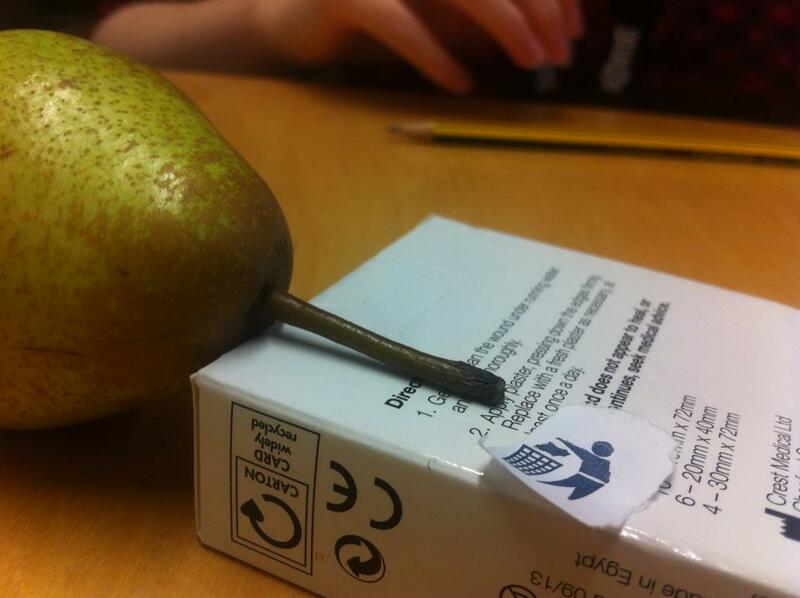 This worked out very well. We could both understand what was going on and where characters had ended up. The result was a much more understandable action sequence. The only thing that we might have done better would have been to keep to the 180 camera rule, however since we could make out the action I don’t think it will be a big deal. The boy spots the spy glass! 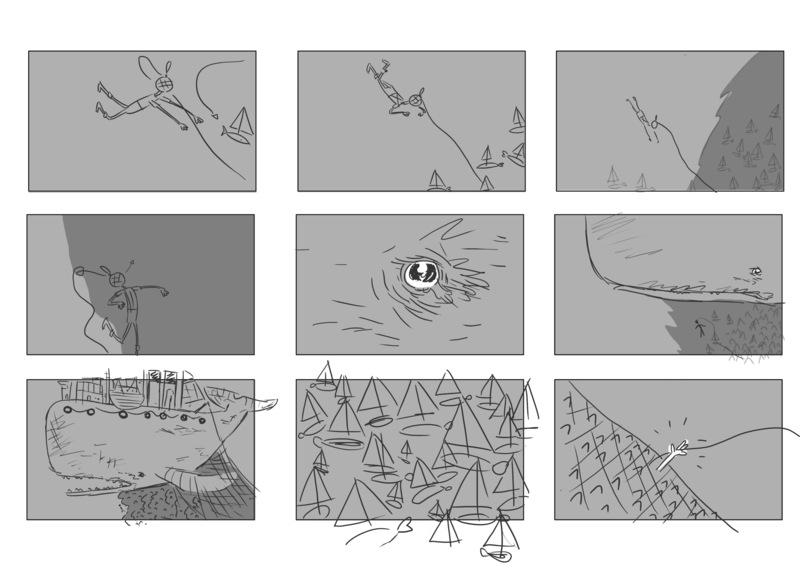 The establishing shot of the boy landing and the position of the crabs. The boy and the Hermet crab and the spy glass. This was the end result lots of post-its stuck down! 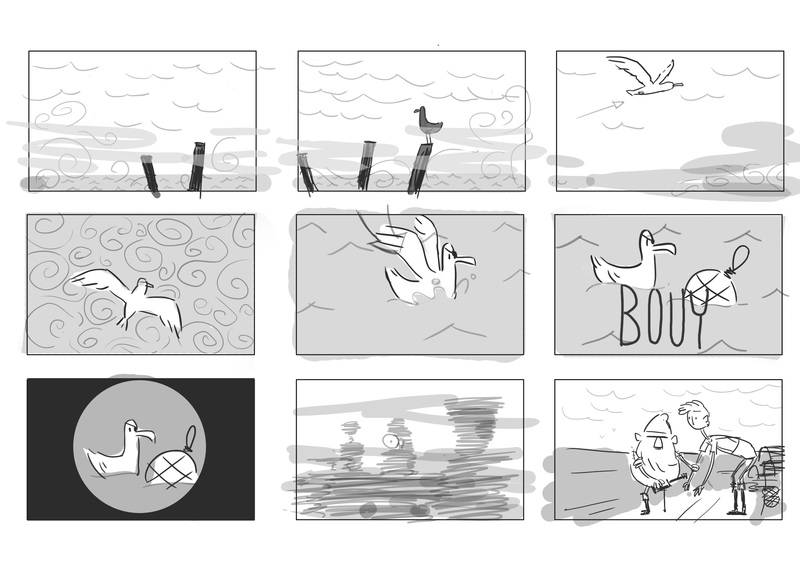 Having finally come to a conclusion on the story of ‘BUOY’ I have completed the storyboard needed for production. 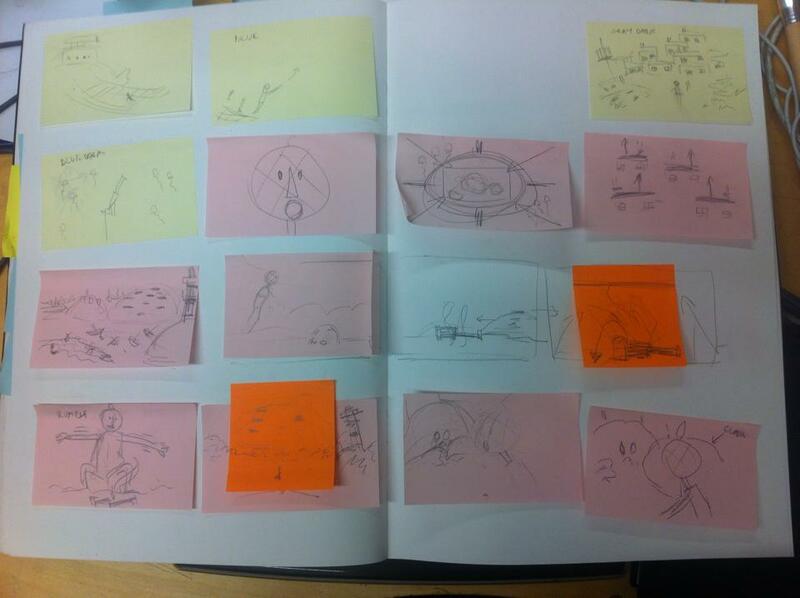 On to colour storyboarding and animatic! This semester is for reflection on practice so I will be doing posts in more detail to go over what I feel went well, what I could have done differently and what I am going to do next. I feel that I managed to get a clear visual of each of the scenes and they have tone. 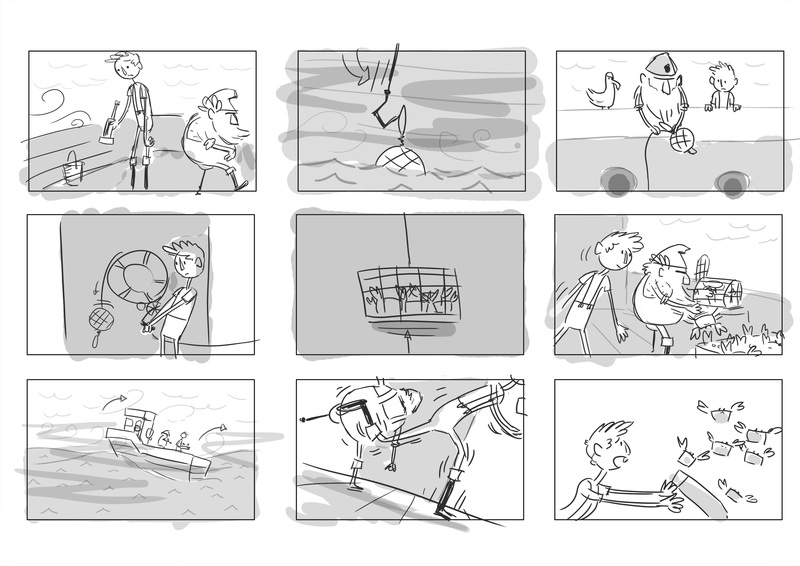 The storyboard isn’t going to change much after this. What I could have done better would be adding notes while I was drawing the scene. When discussing the storyboard with my production manager and lead animator, it wasn’t as obvious to them what was happening. 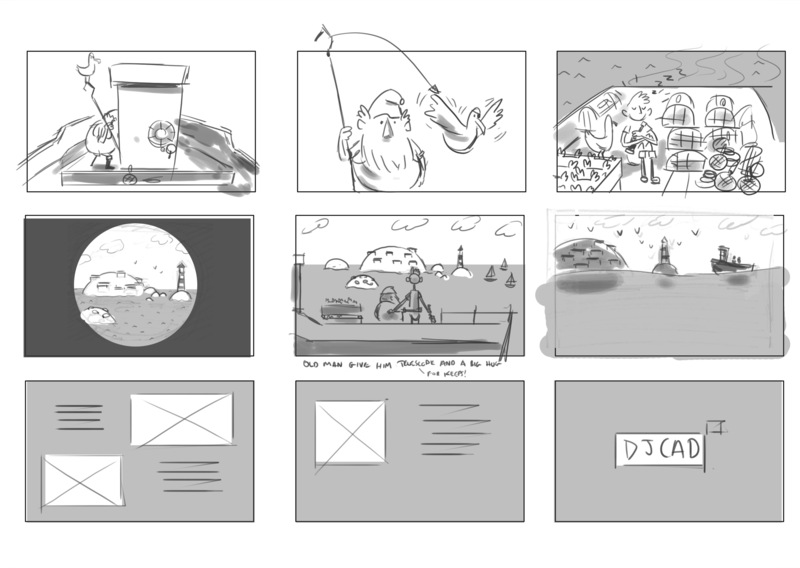 Next I will look at perhaps improving some scene transitions and do the next storyboard in colour!